Make your present unforgettable! This voucher can be redeemed for up to one year after the date of purchase. Voucher to be redeemed at www.thermalbeerspa.com. After booking your session, please select Coupon at checkout instead of payment. You can now purchase Beerspa giftcard for your loved ones. The giftcard includes fast track entry to Szechenyi Public Bath and one 45 minute session to the Thermal Beerspa with unlimited beer for 2 people. The giftcard can be redeemed using the coupon code on our website. 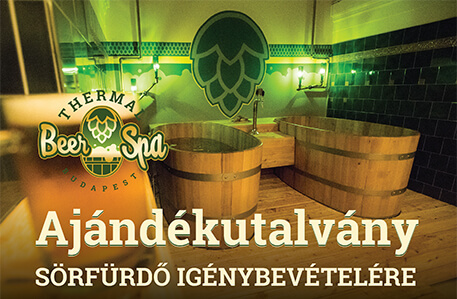 The price of the Beerspa giftcard is 75 euro or 23.000 HUF.